We just released a free tool Tiny Domain Whois. 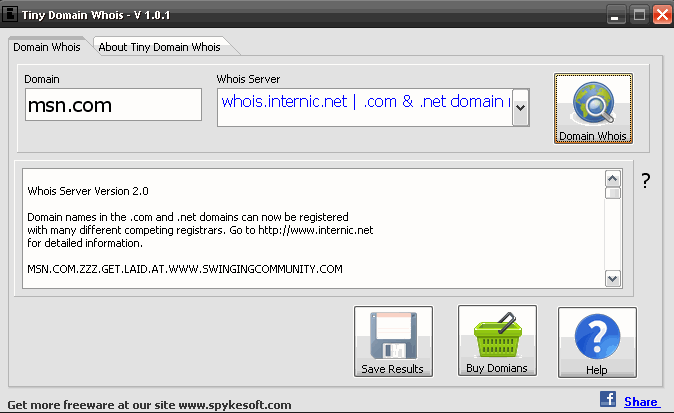 It is a Freeware utility aimed to get all the info about domain names. Tiny Domain Whois new version currently supports 120 domains extentions. Tiny Domain Whois is a portable file -so no need to intsall anything- and works on all MS Windows. Information about domains and addresses in the Internet. Check and Manage Domain Name. Qweas is providing links to Tiny Domain Whois 1.0.4 as a courtesy, and makes no representations regarding Tiny Domain Whois or any other applications or any information related thereto. Any questions, complaints or claims regarding this application Tiny Domain Whois 1.0.4 must be directed to the appropriate software vendor. You may click the publisher link of Tiny Domain Whois on the top of this page to get more details about the vendor.